Japan is a country full of unique and interesting destinations, not least of which is Osaka. As Japan’s third-largest city, it’s a destination that most travelers to the country are eager to visit and explore. If you’re traveling to Japan, Osaka is a city not to be missed. Osaka is a lively port city packed with interesting architecture, an incredible street food scene, buzzing nightlife, and cherry-blossom trees that bring color to the city in the spring. Not sure what to do in Osaka while you’re there? We’ve got the perfect 2-day Osaka itinerary for you. This 2-day itinerary in Osaka ranges from exploring a traditional Japanese castle through to sampling the city’s best eats on Dotonbori Street, to riding a giant Ferris wheel. • Whether you’re staying for 7 days or 2 weeks, we’ve got an itinerary that will fit your needs. • Love food? 3-day guide to Tokyo for foodies. Start your day with a visit to the historic Osaka Castle, which is an ornate building that was first constructed in the year 1583 for General Toyotomi Hideyoshi, who was once the most powerful man in Japan after unifying the country in the 16th century. The castle has since undergone several restorations and it’s the city’s main historical landmark. It’s surrounded by a traditional moat, and if you’re visiting in the spring, you’ll see cherry and plum-blossom trees in their full glory. Be sure to have your camera ready. Directions: Enter through the Otemon Gate. Closest train stop is Tanimachi 4-chrome Station on the Tanimachi or Chou lines. Kuromon Market is packed with cheap eats and stalls selling quirky trinkets. Head to the market for lunch and sample traditional Japanese dishes, such as a hot bowl of ramen, tempura or fresh sushi. Kuromon has become known as Osaka’s kitchen because many home cooks as well as professional chefs get their supplies there. It’s fun to walk through and sample various things, but you can also find restaurants to sit down for lunch. This is a good time to try Takoyaki, if you haven’t already. There is a stall making the fresh octopus dough balls about halfway through the market, called Takoyaki Wanaka. It’s one of the most famous takoyaki makers in Osaka. Stop by to watch them fill the little bubbles with batter and cook them until they turn golden brown. Once you’ve finished lunch, it’s a great place to stock up on souvenirs and gifts. While the main focus of the market is on food, there are tons of other shops selling clothing, trinkets, home goods, etc. It’ll keep you busy for a while. Now you’re fully fueled-up, it’s time to do some shopping. Head to the Shinsaibashi shopping center, which is filled with retail and department stores. Shinsaibashi is a fashion central for Osaka, so you’ll find all the major brands represented here. The roofed shopping arcade extends for 1/3 mile and contains somewhere around 180 stores. It can get rather crowded on the weekends. But if you’re a shopper, I doubt that will stop you. Directions: Enter at the southern end just across the Ebisubashi Bridge opposite the famous Glico Man sign. Namba Subway Station is 5 minutes away. When you reach the northern side, you’re very close to Shinsaibashi Station. The Minami District is where Osakans go to have a good time. The district, in particular the Dotonbori area, is packed with neon lights, bars and restaurants. Dotonbori Street is pretty dead during the day, but it livens up at night when everyone comes out to enjoy the plethora of food options. We like to start walking around the area around 5 or 5:30pm. You’ll need some time to consider your options. You can wander around and stand in various lines to order bits of food all along the street. Start at one end and just eat your way through. That’s probably my favorite way to tackle Dotonbori. But there are many sit down restaurants too. Head for dinner at Nishiya, which serves udon noodles, or try a bowl of ramen noodles at the popular chain Ichiran Dotonbori. 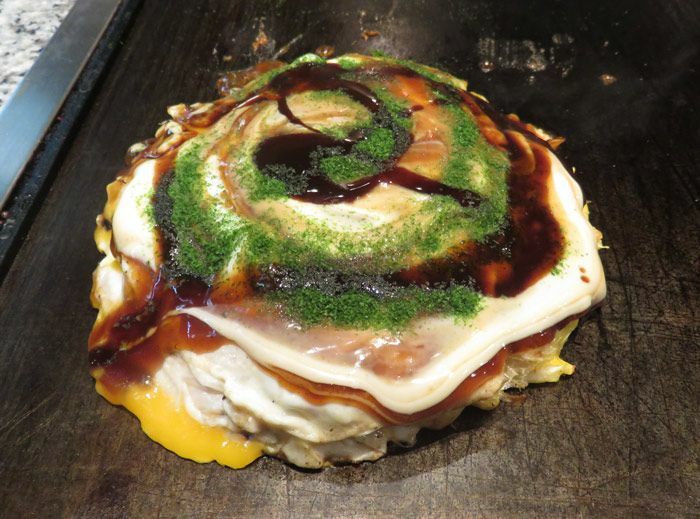 You’ll find the best Okonomiyaki at Mizuno. Don’t let the long line scare you off. It moves rather fast. Finish the night at CinqueCento, which is a lively bar that draws a big crowd of both locals and expats. In addition, if you want to try best izakaya food and drink in Osaka, try this Osaka Bar Hopping Food Tour with Magical Trip. You”ll get to experience authentic Osaka food at local izakaya bars that travelers normally couldn’t find. There is a bit of traveling around that needs to happen today, so plan to take the train! Start the day at the impressive Osaka Aquarium, called Kaiyukan, which is one of the world’s largest. At the aquarium you can see a large range of sea creatures found in the nearby Pacific Rim, including a variety of sharks, otters and jellyfish in the 15 enormous tanks that each represent a different area of the Pacific Rim. The aquarium takes about 2.5 hours to walk around. They have many permanent displays to explore, plus a few interactive displays. It’s a great way to spend a morning. Get tickets in advance here. After you’ve visited the aquarium, head to nearby Osaka Bay, where you can ride the giant Tempozan Ferris Wheel, which stands over 350-feet tall and 100 meters in diameter, and gaze at the port and surrounding city. The ride takes about 15 minutes. Now that there are Ferris Wheels all over the world, it might not seem that exciting, but this is one of the world’s largest Ferris wheels and you can see for a long distance from up here. By now you’ve probably worked up an appetite. Head to Tempozan Marketplace, which is located between Osaka Aquarium and the Tempozan Ferris Wheel. You’ll find cheap street food stalls and a variety of Japanese and Western options in the food court. Try an iconic Osaka dish like grilled squid, kushi-katsu (deep-fried skewers), and okonomiyaki (savory pancake). Kita (also called Umeda) is the northern downtown business core of Osaka. There are many restaurants and bars, as well as shopping centers and parks in this area. Since there are so many things to do, you’ll want to arrive in this area with plenty of time to check everything out. The Umeda Sky Building is one of the tallest and most unmissable buildings in Osaka. It’s actually two buildings that are connected by a sky bridge. You’ll understand the attraction when you see it. At the top there is an observation deck called Kuchu Teien Observatory, which means “Garden in the Sky”. Open 9:30am to 10:30pm. Adults 1500 yen, child 700 yen. Tenjimbashi-suji Shopping Street – If you thought the Shinsaibashi arcade was long, this one is the longest arcade in Osaka. Lots of shopping to be done there. Hep Five is another shopping and dining center, but it has a ferris wheel on top (7th floor). It’s a very similar ride to the Tempozan Ferris Wheel, but I think this one is even more fun. At night the city of Osaka lights up with flashing billboards and neon lights. One of the best places to see the lights is in the Umeda area. Directions: Get off at Osaka Station on the Osaka Loop Line. Walk northwest about 7 minutes to Umeda Sky Building. You can’t visit Osaka without experiencing both the sake and the Matsusaka Beef. The best place to try both is at the M300 Sake Bar just at the start of Dotonbori Street. Be forewarned, you must make a reservation for this place. It’s incredibly popular. You can walk in for sake tasting and sit at the bar downstairs. This is how we initially came across this restaurant. You can pick and choose which sakes you’d like to taste from their extensive menu, or do a flight tasting. It’s a great way to spend an hour if you need a break from walking and sightseeing. When you see the food passing through the bar to the restaurant upstairs, you’ll wish you had a dinner reservation. They serve only the best Matsusaka beef and Wagyu here. You can order a set range of beef, which comes as raw slices on a plate, and you cook them yourself over the small grill at your table. Each table is in its own room with a door, which makes it very unique and fun. We also very much loved the Matsusaki beef sushi they serve. I would go back there in a heartbeat. It was sooooo good. Directions: 5 minute walk from Namba station. Located on the street just behind the Dotonbori Leica man sign. Once you’ve spent some time in Osaka, you’ll understand why we love it so much. From the food to the views, the shopping, the nightlife, it’s a fantastic city to visit, and fall in love with. We hope you’ve enjoyed this 2-day Osaka itinerary. Let us know if you have any questions before going there yourself. Like this post? We’d love if you’d share it on your Pinterest board! This post is brought to you by AlltheRooms.com. This entry was posted in Itineraries and tagged japan. One of the highlights of my Japan trip is going to the cherry blossom festival. It is a truly an awesome experience. I also love Japanese food such as ramen and matcha tea. You’ve chosen a great time to go. The cherry blossoms are incredible. I’m a huge fan of the ramen and green tea too!